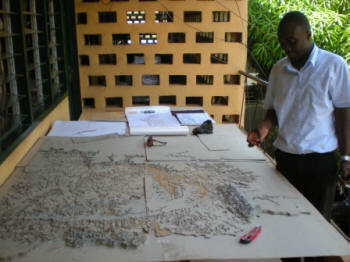 This 1:250,000 scale Participatory 3D Model of Northern Ghana has been manufactured with a 5x vertical exaggeration to serve as tool for Climate Change, Food Security and Sustainable Development Planning in January, 2011. The model measuring 1.9 m x 1.5 m (112,440 km2 on the ground) has been the 1st P3DM exercise done in Ghana and specifically it has been done for regional flooding, food security and climate change planning. This to enhance a timely and conscious involvement of development agents and communities in the design and implementation of interventions involving them; and to develop sustainable mechanisms and systems for enhancing the communication, collaboration and linkages between development organisations, governmental institutions and communities. Regional Directors of Agriculture, District Directors of Agriculture, Metropolitan Assembly, Representatives Governmental and Non-governmental Organisations, Farmer Groups attended the exercise. The climate has changed; droughts, floods, erratic and unpredictable weather conditions continue to threaten the livelihoods of people in Ghana especially in the Northern sector. 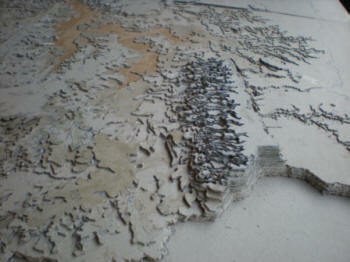 It is unprecedentedly washing away communities, destroying biodiversity and natural ecosystems. It is therefore necessary for the cooperation and active participation of all those concerned to ensure the sustainable management of our environment and natural resources. Since 2007 most communities within the catchment of the Volta river basin have experienced annual flooding but no permanent intervention has been put in place yet. From December 2006 to June 2007, Northern Ghana experienced long dry conditions and soon after was hit by heavy rains which resulted in floods killing 20 people and leaving 260,000 homeless (OCHA, 2007). Most of the people who were affected in the floods were poor farmers, who after losingtheir farms and other properties suffered from the aftermath of the floods, a contaminated environment and contaminated water. Farmers within the catchments of the Volta river basin have began recording a drop in yield of 30%, a value less than the crop potential yield (CPWF, 2007). This confirms the DFID (2004) and Nhemechena et al. (2007) reports that climate conditions will increase with frequency and intensity of extreme weather conditions in Africa resulting in food and water insecurity. This has turned into an annual phenomenon but so far most interventions made to tackle this menace have been a post-disaster relief. Attempts to relocated affected communities have also proved futile as communities are just reluctant to move anywhere. A more holistic approach is therefore needed to effectively manage this situation. 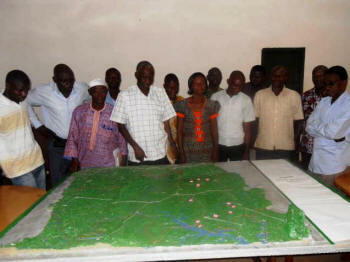 A community participatory 3-dimensional modelling is a powerful community-based communication, research and planning tool that give stakeholders, both literate and illiterates, rich and poor, professional and non-professional, a common platform to make informed decisions on how best to manage their environment and resources sustainably. Peoples Participatory GIS (3D Modelling); Ghana Interactive Food Security Forum (GIFSEF), blog by the Ministry of Food and Agriculture; Ghana.